Having a scarcity mindset can be transformed into creating prosperity. There are many ways to make that happen and I would like to define a few here. 1) Priming the pump or paying it forward: This is where your generosity comes into play. It is doing something before you have to do it. 2) Don’t sweat the small stuff: Giving a bit extra can be a great way to transform your thinking. I know that with several of the companies with which I do business, there is a “round up” of the change on your bill to the full dollar. This money is then donated to their favorite charity. This is an easy way to fell prosperous. 3) Invite others to share in your good fortune: Prosperity, like realizing a dream, requires three aspects to be balanced: Vision, Structure and Support. This action works on the support leg,which is the leg that is most often neglected because you don’t want to share the downs with others. Yet, this is critical to staying on track toward the prosperity you deserve. 4) Add value in a relationship: This also works toward the support leg. Bring your time and energy to the relationship to develop depth. 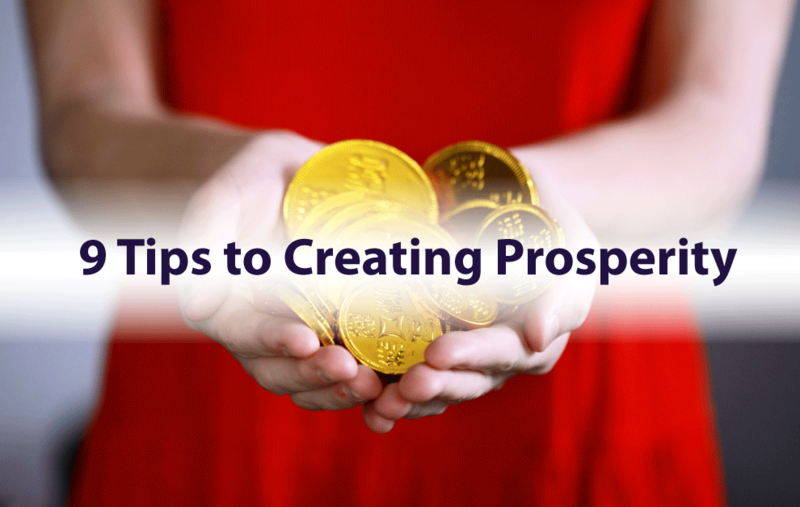 This will provide prosperity in other areas of your life beyond just money. 5) Have appreciation for what you do have: Always being gratitude. Create a gratitude journal and record 10 things you are grateful for each day, even on those days when it is tough to come up with them. It is a powerful motivator. 6) Be willing to make and keep your commitments: Being in integrity is one way to eliminate a cause for stopping prosperity. Unresolved, incomplete breeches of integrity can stop prosperity from flowing. Write them down with what you are feeling and then add what you will do to clear this up and when. 7) Create a plan to get there: See the possibilities and make a plan you can follow. This is the structure segment that makes the focus and determination possible. It provides a road map to where you are going on this journey. 8) Be focused: See the future as you want to see it and not all doom and gloom. I know that I sometimes get distracted that, for lack of a better thought, have me chasing monkeys. To reach your dreams and visions, the plan you set provides that focus and determination to see it through. 9) Get the juiciest tip of them all here. Let’s take the actions needed to look at the possibilities and create the prosperity that you deserve in crafting an extraordinary life. In Step 4 of the Reclaim the Dream Workshop, I show you ways to bring prosperity into your life to bring balance amide the passion of your dreams. I help you to fund your dream and to live an extraordinary life. Are you willing to take the step necessary to live in prosperity or is scarcity your mindset? Something else I have learned as a business woman is to ask for what you want. If you loved what you just read, this content is not for free. As a form of payment, I am asking you simply to comment or share this on Facebook or tweet about it on Twitter. Linda Patten, MBA, BSN, RN has over 30 years of experience leading women to success in building and achieving their dreams. She turns networking marketing women from product sellers to leaders of highly functioning teams. To learn more about her innovative programs, click on Contact Us.